'Sounds familiar?' asks Shekhar Gupta. One reason I so love my job as a journalist is that I also love to tell stories. It's a regret, therefore, that I do not have many stories for my columns on Indira Gandhi's birth centenary. I was 27 when she died. Yet, given how limited VVIP security used to be, I found myself close to her on two occasions. She was out of power in the summer of 1979, and going to Srinagar on what used to be the only flight to the city, an Indian Airlines HS-748 Avro (IC-421), which did the daily Delhi-Chandigarh-Jammu-Srinagar hop. It was for a few minutes during her Chandigarh stopover. I managed to get close enough to ask her a few questions. More lasting than the story was the memory it left behind, a black and white picture of that little chat, with Giani Zail Singh and V N Tewari (former Congress minister Manish Tewari's father) listening with great attention. My second, and last, opportunity was more insightful. It had to wait for four years until February 1983. On February 18, the great massacre of Nellie took place 120 km east of Guwahati during Assam's widely unpopular election. More than 3,000 Muslims had been slaughtered that morning. The next day she came to visit the spot. She stormed out of the helicopter as soon as the rotors stopped. But the dry sand they had churned from the post-winter floodplain swirled in the air. Mrs Gandhi covered her nose with her pallu, but it didn't hide her anger. 'Teen hazar musalman mar gaye, iss ka kaun jawab dega, aap? (3,000 Muslims have been killed. Who will be held accountable? ),' she scolded R V Subramanian, then chief administrator of the state (as chief advisor to the governor) under President's Rule. Both listened in silence like contrite schoolboys. I thought of a Satyajit Ray interview in which he talked about a day-in-the-life-of type of documentary he was making on Mrs Gandhi. As she went through -- or pretended to go through -- her daily chores, adjusting the odd chair in her living room or shifting a picture, she picked up a dust-coated framed portrait of her father and seemed looking for a mop. 'Why don't you dust it with your saree pallu? It will be a great shot,' suggested Ray. Mrs Gandhi said 'no'. 'Why not, Mrs Gandhi? Don't you have sentiments for your father?' Ray apparently asked. That fraught and short morning in the dusty Brahmaputra Valley didn't mark one of Mrs Gandhi's finest moments. But the decision that led to it counts among her toughest. A popular and mostly peaceful mass movement against 'foreign nationals' had raged in Assam for four years. Such was its sway that even the supply of crude oil from its oilfields had been blocked. The state had no control. This forced election, despite popular boycott, was the Indira way to restore authority. It cost -- in my estimate -- 7,000 lives in just over a fortnight, a majority of them Muslims. How would history assess her for this? This exercise of State power was brutal, cynical, and violent. She installed an elected government even if polling was lower in many constituencies than in the Kashmir valley: A minister got 100 per cent of the votes cast, all 266. His opponent couldn't even cast his own because of protests. She wasn't one to bother. This ruthless side had become evident even during her bumbling early phase of being 'goongi gudiya' (dumb doll -- Ram Manohar Lohia's infamous description for her) in Parliament. Much like her son later, she had been catapulted to prime ministership by a sudden death, that of Lal Bahadur Shastri. India was recovering from a string of withering wars (1962 to 1965), combined with food shortages. She was weeks into her new job when Mizo rebels took over Aizawl, and were about to over-run the treasury and the Assam Rifles garrison. She did something nobody has done before or since: Use the Indian Air Force to strafe Aizawl. It is criticised now, but it saved the day then. From strafing Aizawl to the decisive war in Bangladesh, to the Assam elections of 1983 and Operation Blue Star a year later, the same unforgiving exercise of power, a belief in the supremacy of the State, defined her style. Each of these actions left its scars. But the larger threat to India was permanently removed. Pakistan will never be a two-front threat, and Bangladesh could be a reliable ally. Its social indicators are better than Pakistan's. It's doing better in sport. Even the Dhaka stock exchange beats Karachi's market cap. Mizoram is now the most peaceful tribal state in the north east. In Assam, the mass leaders who blocked oil supplies and the elections of 1983 signed an accord with her son, contested elections, won power twice over, lost it. Today, their rump is a marginal coalition partner with the Bharatiya Janata Party. Similarly, while she was assassinated for Operation Blue Star, Punjab has had normal politics for 25 years. Hers were not the gentle, skilled cuts of a surgeon's scalpel but more like a wood-cutter's scythe. These left scars. These also created her new opposition (much of it out of her own party) and today's non-Congress leadership too. In another column on the 40th anniversary of the Emergency, I had noted that almost everybody who is anybody in today's establishment was jailed as a young leader by her during the Emergency. She did brilliantly on national security through challenging years. But there are two big failures: One, her record at maintaining communal peace was embarrassing for someone who not only claimed to be secular but also was genuinely so. Some of the worst riots took place under her watch. The second, and the greatest, failure was the damage she did to our political economy. Nehru's socialism was gentler. His Left impulse reflected the idealism of his times. Mrs Gandhi's was cynical. She was no liberal romantic, but a Cold Warrior. She used socialism to split the party, and nationalised one industry after another: Banks, coal, petroleum, insurance, nothing was spared. She even blundered into nationalising grain-trade, pucca Communist style in 1973, but panicked under farm distress, the only time that she lost nerve in her lurch to the Left. Some of the damage she did to our Constitution is permanent. She added the word 'socialist' (and 'secular') in the Preamble through an entirely illegitimate and unconstitutional Parliament (in the 6th year of its extended term during the Emergency). From 1991 onwards India has been moving towards a market economy. Yet we can't see any leader with the courage to de-contaminate our Constitution of that illegitimate insertion. Even if the BJP wins a large majority someday and amends the preamble, secularism will go, socialism will stay. The evidence keeps coming. 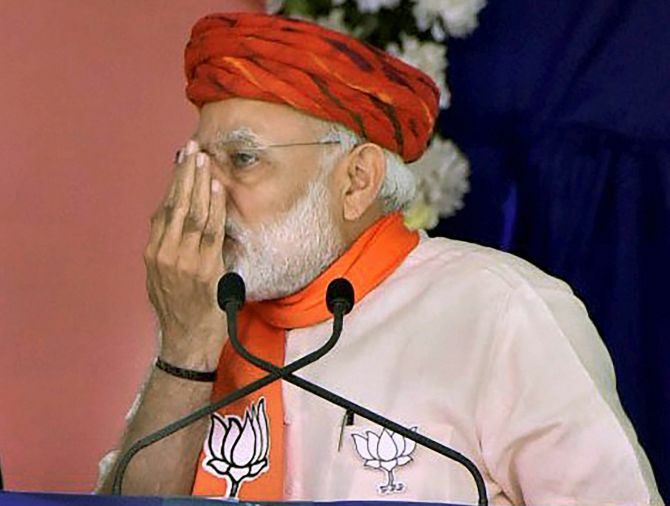 Lately the Narendra D Modi government, instead of reversing her worst economic decision -- bank nationalisation -- threw Rs 2.11 lakh crore to 'revive' banks. Modi's political economy is more inspired by Mrs Gandhi than Atal Bihari Vajpayee. And politics? The method Mrs Gandhi perfected was 'Total Politics'. The entire nation had to be conquered by her party, the Opposition destroyed -- through populism, alliances, smash-and-grab, hook-or-crook, and Article 356. She had as much time for the Opposition as for dust. She so wanted an Opposition-mukt Bharat. Sounds familiar?